Fishing has long been associated with the island of Ireland, the Emerald Isle kissed by the warmth of the Gulf Stream enjoys a high rainfall and its coasts are fractured by many rivers large and small almost all of which provide salmon fishing and sea trout fishing. Inland there are some large limestone loughs offering trout fishing of exceptional quality. There are several excellent guides and instructors who can offer tuition in the ways of angling peculiar to Ireland and provide an excellent experience on the rivers of the west and south and on several of the great loughs, including Corrib, Conn and Currane. Angling for salmon in Ireland starts on January 1 in some rivers and fresh fish are caught that early but most of the prime fishing is from June onwards when vast numbers of grilse can be expected. Compared to the Scottish fish, Irish grilse are small, some barely two pounds and most of them less than six pounds but what the lack in size they more than make up for in quantity. There are several very good trout rivers in Ireland and many excellent trout loughs. 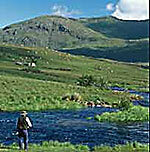 I can arrange fly fishing vacations and fly casting and fishing instruction at several venues throughout Ireland. 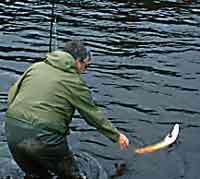 Fishing the Irish loughs is mostly by wet fly and on occasion with dry fly or dapping. A reasonable length of rod (10 or 11 feet) is useful for working the team of three flies through the waves and especially for dibbling the bob fly on the surface at the end of the cast, a very successful and entertaining method. On the rivers a 9 ft #5 rod is perfect for casting dry flies and nymphs. Most of the Irish salmon rivers are small but on the larger ones a 15 foot rod is required to cover the water, I am thinking of the Munster Blackwater and Galway Weir for instance. Elsewhere a 9 foot 6 inch #8 single hander or a 13 foot double hander is adequate. Ireland has a wonderful history of fly fishing and some fantastic fly patterns. Anyone wanting to learn more about them should find a copy of E. J. Malone's classic reference "Irish Trout & Salmon" flies, even if you never intend fishing in Ireland no fly tyer should be without this book. For the salmon angler the Irish Shrimp flies are the most significant of the Irish patterns, there are a large number of them the best of which are Curry's Red Shrimp, Bann Special Shrimp, Wye Bug Shrimp and the Wilkinson Shrimp. There are legions of trout flies, whole families of them. dabblers, goslings, mayflies, daddy-long-legs and of course those most famous Kingsmill Moore patterns, the bumbles. My experiences in Ireland are fond memories of a lovely place charming people, super fishing and I can't wait to get back. The Guinness is not bad either!